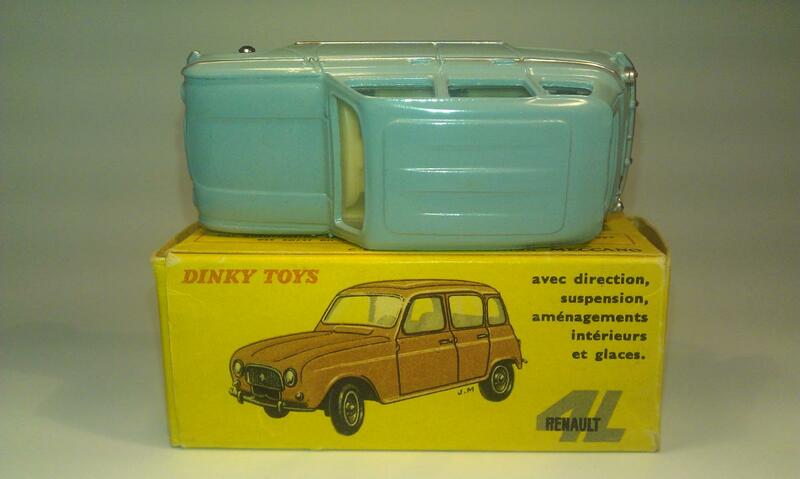 The Renault 4L was produced by Meccano France from 1962-1971. It was issued with steering wheel direction, suspension, interior, windows and highly detailed silver trim around the car. It got model number 518 and replaced the 524 Renault Dauphine. 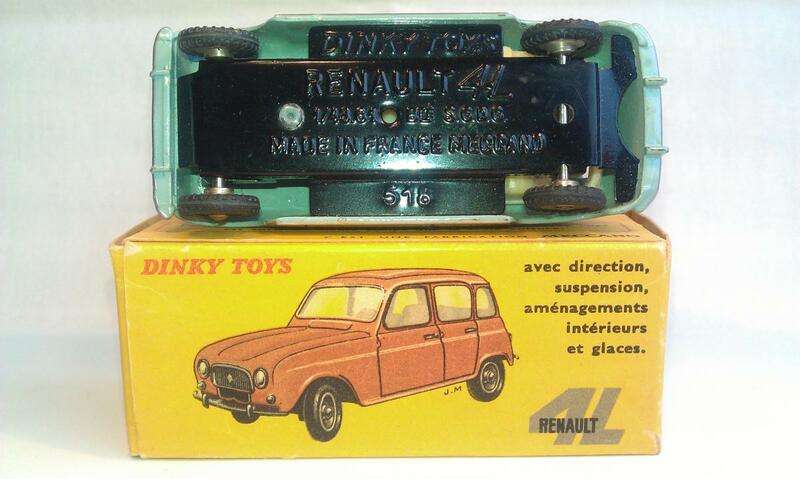 The Renault 4L was also available in UK with the same model number 518 and was part of a series of imported Dinky Toys from France to UK with the slogan "Dinky Toys from Paris ". I show model 518 (in a somewhat strange UK order) in the various advertisements in Meccano Magazine France and UK and the DT catalogues and leaflets. 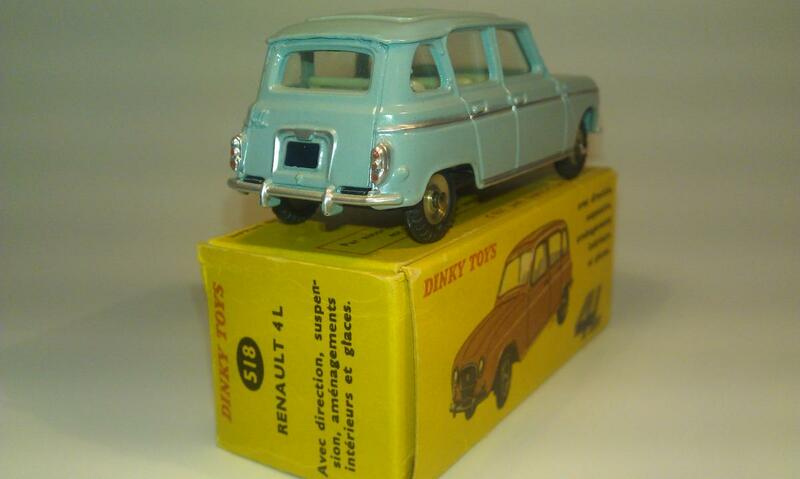 May 1962: Part of Price list Dinky Toys catalogue UK including all imported French Dinky Toys, including 518. 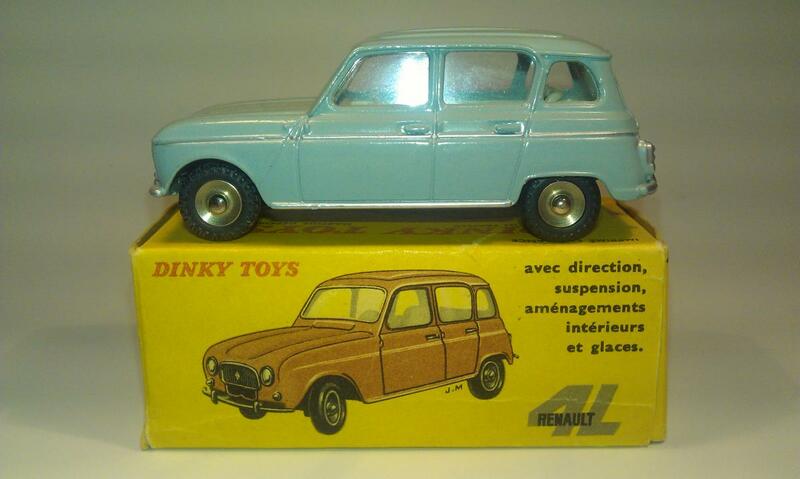 The French Dinky Toys were not depicted in the UK catalogue. 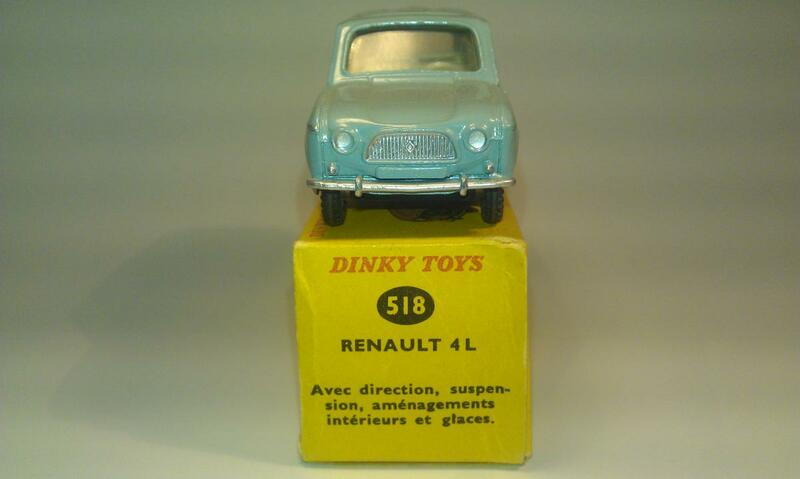 July 1962: Part 1 announcement total range of French Dinky Toys imported to UK in MM UK with the statement “and should be very popular with British boys”. 1961 : Renault 3 - The cheaper version of Renault 4 without decorative trim. 1961: Left Renault 4L with decorative trim. Right the cheaper version: Renault R3 without decorative trim. A Renault 4L car getting up the stairs of Rialto Bridge, Venice, 1961. A Renault 4L car getting down the stairs of Rialto Bridge, Venice, 1961. Because the rear torsion bars are located one behind the other, the wheelbase is longer on the right side than on the left. 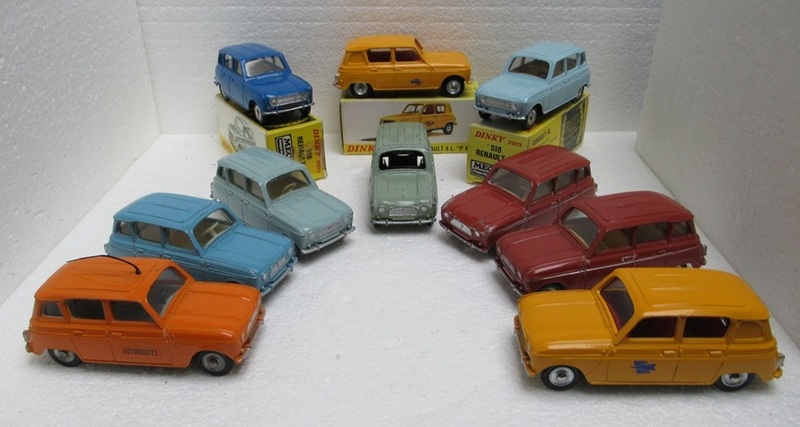 Renault 4 model variations through the years. 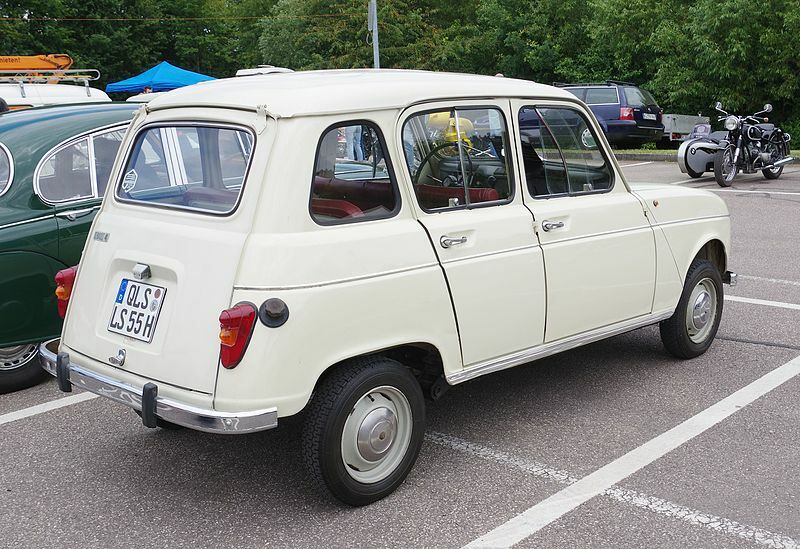 The Renault 4, also known as the 4L (pronounced "Quatrelle"), is a hatchback economy car produced by the French automaker Renault between 1961 and 1994. It was the first front-wheel drive family car produced by Renault. The car was launched at a time when several decades of economic stagnation were giving way to growing prosperity and surging car ownership in France. 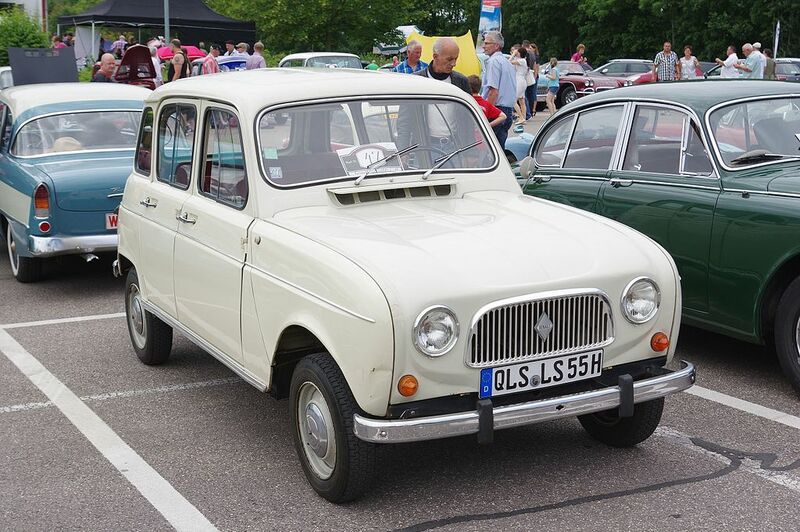 The first million cars were produced by 1 February 1966, less than four and a half years after launch; eventually over eight million were built, making the Renault 4 a commercial success because of the timing of its introduction and the merits of its design. Although originally marketed as a small estate car, it is now regarded as the first mass production hatchback car. 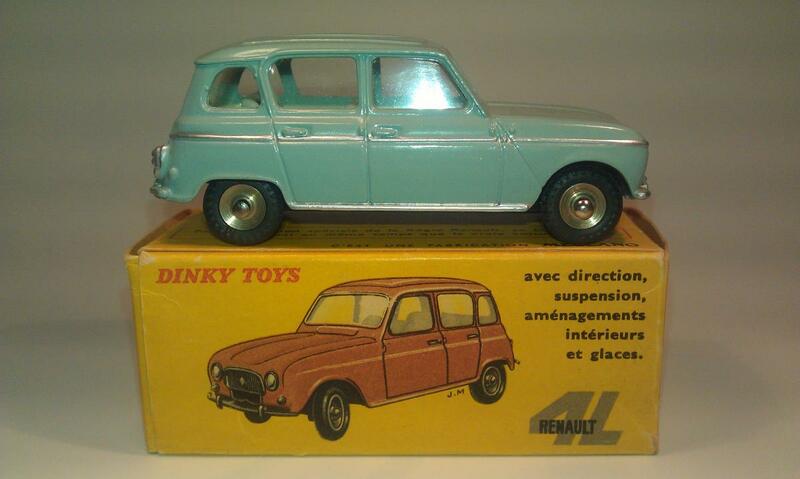 I show pictures of the only example that I have acquired in the colour light blue on which you can see the highly detailed silver trim around the whole car... and pictures of the real Renault 4. There are different colours and variants of the 518 issued, including those made by Poch in Spain. I hope that others want to contribute variations and information’s of this beautiful model. Kind regards, Jan Oldenhuis, 21 August 2018. 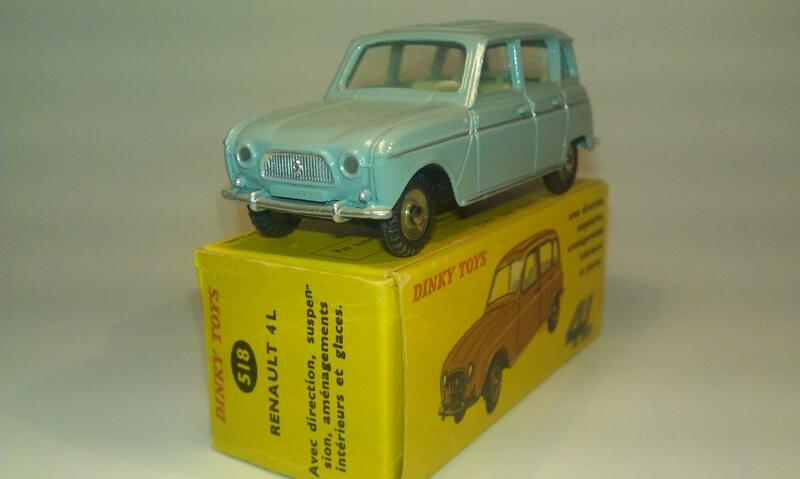 Jan -- some lovely details about the Renault 4. I'm ashamed to say that while I have owned four Renaults -- a 4, a 5, and two US-model 9's (Alliance and GTA), I did not even know about the existence of the 3!! 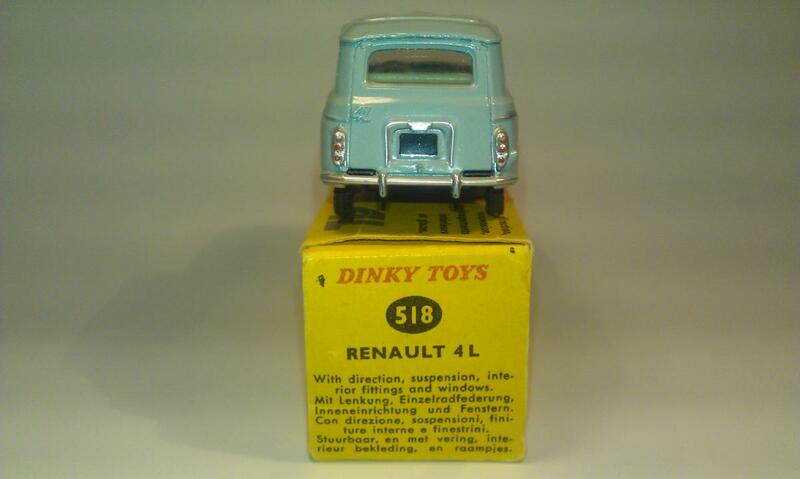 The latter's lack of a rear window of course reminds me of the R4 van as modeled by Dinky in the PTT version. I will always feel a special connection with the 4 because my son was almost born in mine as we drove to hospital on a windy, wintry night in fen country. My wife's contractions were such that she could not bear to sit in the passenger seat, so I folded down the rear one so she could lie back there. On the two-lane road into town, which would be traveled at 60-mph speed by many commuters only a few hours later, high winds lifted the car and moved it on the ice until we were sideways blocking the middle of the road. The 4's name was Andre. I guess if my son had come a little sooner his would have had to have been, too. I'm grateful Dinky made such nice models of the car! Very good job Jan on a car which is still enjoying young people and students. You probably knows about the "Raid 4L trophy"
The meeting point is Biarritz in France south west, they cross Spain and Marocco for a 10 days raid. My first car, as you, was a 4L. Jonathan, thank you for your touching story ; you must have been very anxious that night !! Here under some of my Renault 4L variations. Some are missing and I will soon do a group photo. Here are all my Renault 4L ...... waiting for the next one ! 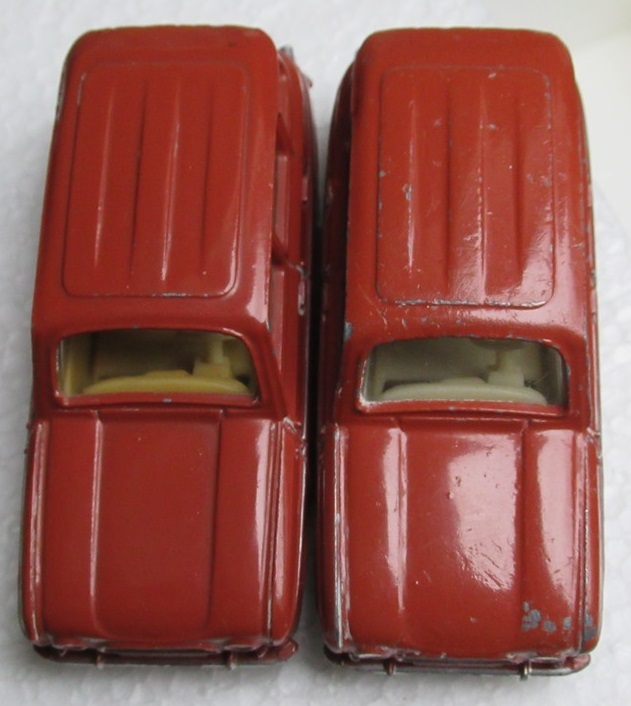 You will see that the red models have two different coloured interior fittings : white and dark cream.